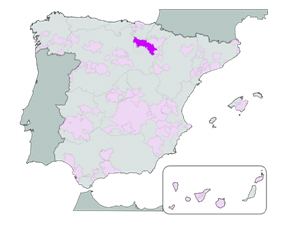 Located in northern Spain along the banks of the Ebro River, Rioja consists of three designated sub-regions – Rioja Alta, Rioja Alavesa and Rioja Baja. Soil: Complex and varied, primarily alluvial with limestone, calcareous clay rich in iron. Slightly alkaline, low in organic matter with a moderate supply of water. Climate: Mediterranean benefiting from the confluence of the Atlantic and Mediterranean sea. Grapes: Red – Tempranillo, Garnacha, Graciano and Mazuelo. White – Viura, Malvasia and white Garnacha. Wines: Complex with a reputation for ageing. Crianza, Reserva and Gran Reserva are the best known wines; elegance, harmony and tact. Jovenes are excellent when young; substantial and powerful. Riojas are typically well balanced in color and acidity.